Several people asked if I would post my little flower hat pattern so I knitted up another so I could write up the pattern. I also knitted up one with hearts and another with stars, these are also included below. Rows 5-17 - work the 13 rows from the chart. Knit the odd rows and purl the even. Cast on 80 stitches. Knit 4 rows in double rib (K2 P2), then 15 rows from the above chart, then 7 rows in stocking stitch, decreasing 2 stitches on last row. Then shaping as above flower hat. If you want to add a bobble then when you get to 12 stitches, draw up the stitches on a length of yarn and secure. Thank you so much, Sue! All three of the hats look so cute and inspired. My personal favorite is the heart one, it is darling. I owe some family friends some baby garments (for a little girl! ), and so I am probably going to have to knit one up! So nice! I wish I had a little one to knit for. Maybe I could try a larger one. 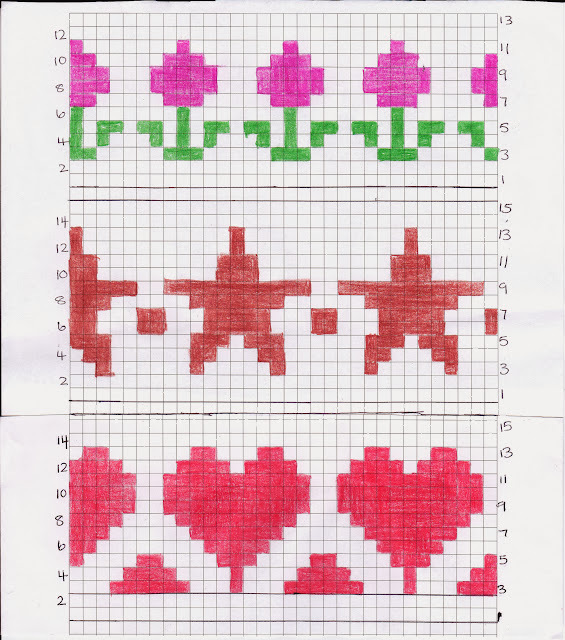 You are so sweet to post your patterns. Ah, the patterns for your wonderful hats. Thank you. The photographs, although good, do not do them justice. They are so pretty. It's worth buying an extra ball of yarn to make one of your hats to go with a cardi or sweater. Thank you so much for sharing this wonderul patterns!!!! !